A clever modification by a Royal Enfield dealer gives this Electra model an unusual look. The rear fender now rides up and down with the rear wheel. The change almost gives the rear suspension the clean look of a rigid motorcycle. "The story is that a customer approached us on building an Enfield that no one else had: 'one of a kind.' I took a software package and cut and pasted some things together from different bikes from the era and we started building. We ended up with a 'hooligan bike concept.' We chose the aluminum fenders, chrome tank, polished fork top yolk, chrome headlight bracket and 6.5-inch halogen headlight, original Smith gauges, shorty pea-shooter muffler, fork gaiters, braided cables and brake line and solo seat. 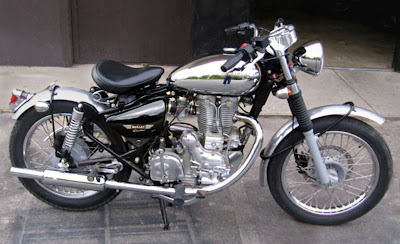 "The biggest issue was the large ugly metal sub frame that the original seat and fender were mounted to. Once the solo seat was mounted it looked awful no matter what we did. After several tries we had an epiphany: Let's eliminate the sub frame all together and fabricate a fender that moves with the swing arm as it rises and falls. 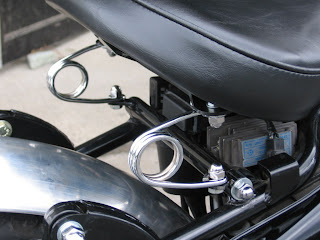 "We had to come up with a swing arm clamp that would allow the fender to pivot and fabricate a hoop over-design to hold the fender and turn signals in place while allowing it to move up and down with the swing arm. While we were at it we decided to fabricate a new mount for the seat and clean that up so we welded up what we needed and used hair pin springs instead of the traditional coil springs. "As you can see from the pictures it turned out to be a pretty cool and functional design. Really the only things that are still original Electra are the frame, engine and wheels. The passenger pegs are still on. You can loop your feet over them for a different riding position. Not sure if they're staying on at this point. We do quite a few Enfield customizations at our shop. If someone wants something unique we discuss it and usually we can do whatever they want. We like the creative aspect. 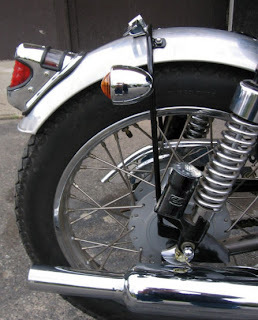 We are just starting another one that's going to have a leaf spring solo seat mount, will be stretched about 3 inches and end up being more of a cafe bike but with a longer and lower line than any other Enfield."